Nervously approaching our first interview we were so blessed to have the grace and calm of local artisan Mariana Barrios of Wear Knots, agree to catch up with us for a coffee at the Balcony Bar and Restaurant. 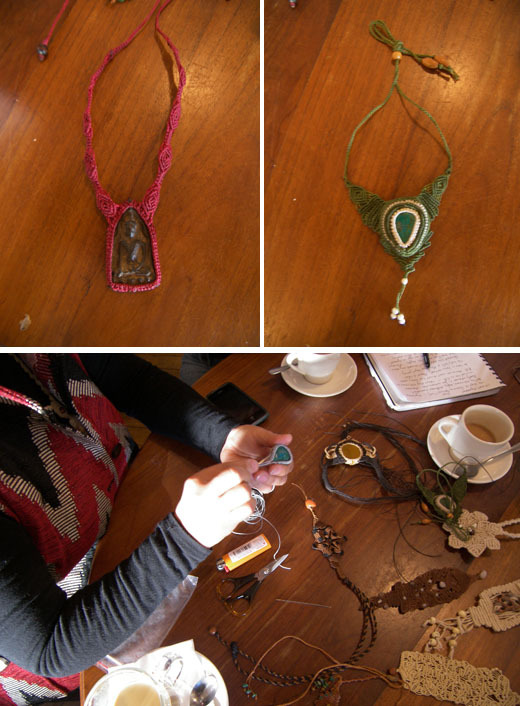 After a few glitches with the use of Voicememo on the iPhone and wondering whether to start the chat before the waitress took our orders we finally settled in to hear how Mariana came to Byron and started creating her beautiful hand knotted jewellery. Like many of us here in Byron, Mariana is a refugee, however she has come a bit further than most. Mariana came to Australia in 1987 from Chile with her then husband and two sons. Settling first in Perth, she eventually separated and met her current partner and love of her life, Paul Spooner (our illustrious leader of the Byron Community Centre). They have been together now 18 years and are about to get married in early 2012. Yay! What brought you to Byron Bay? I first heard of Nimbin on a TV program. I asked Paul where it was and he got out a map to show me, it was near Byron where our friend Marlena lived. I wanted to see more of Australia and Fremantle (Perth) was feeling too isolated so we packed up the house, kids and Combie and headed east. We called in on Byron to visit Marlena and left my two boys with her while we looked for a house in Brisbane. Living in Brisbane provided work but there wasn’t much to do, so we used to come to Byron on weekends. My eldest son fell in love with a local girl which brought us here even more often… and of course, they loved the surf, girls, lurrvve, alcohol and rock ‘n roll. I was sick of only doing cleaning jobs and my English was getting better so I decided to look into becoming a Barista. While Paul was looking for courses for me he stumbled upon a job for Byron Youth Services, which he got. Funny how this brought us to Byron and I still haven’t done the barista course. The friendliness of the people and how they offered to help us; especially the people at Paul’s work. I was very focussed on finding a house but we didn’t know where we wanted to live we just knew we wanted to be near the beach. We dowsed with a pendulum over a map of Byron, first trying Ewingsdale, then Sunrise but the pendulum settled on Suffolk Park. We went to the real estate office and found a 3br home with swimming pool opposite the beach listed for rent… just what we wanted. What did you do when you first came to Byron and when did you discover your passion? I went to the Byron hospital and asked for a job. After a few months I got a position as a tea lady but eventually became very unhappy. I got sick very often in that six years. One year at the Dreaming Festival I came across a couple selling macramé. I was attracted to their stall and over the few days got to know Zoila. She told me she wanted to come to Byron and I asked her to let me know. She came a few months later and I did about six macramé classes with her and was hooked. I started researching on the Internet and totally immersed myself in pattern books from the 70’s and crazily knotted – I felt so happy. Mariana showing us how she works. When did your first piece sell? It took a while… I was at a bbq and was encouraged to bring out some pieces. I carry them around with me all the time, like a business card… and went and got them out of the car. I made $200 that day. That’s when the light switched on that that was what I wanted to do. I started at the community bazaar with 60 little pieces, each one unique. I was very excited about it. Set the table up all nice and each piece was only $25 and not one piece sold. Horrible. Then Paul said to try the Artisan Market… it was fantastic. I was busy from 4pm to 8pm and selling lots, mainly to city visitors, working women. They raved about them. So then I went to the Byron Market and sold nothing. Nothing! I went back to the Artisan Market but it was finishing at the end of that summer, so I went back to the Byron Market. By then I had a business card and Paul built me a website and I discovered slowly through people contacting me that it was popular. I don’t have another job but I don’t have a million dollar business either. I don’t want to grow too big because I can’t keep up with production. And every piece is unique, like a one off, so it’s not about a production line. How do you price your pieces, do you assess your time and materials, or is it intuitive? No I don’t assess. I have set prices of $85, $65, $40, $25 and $10. People tell me I should sell them for more, but hey, when $190 is on them they don’t sell, but as soon I put $85 they sell. If I were in Melbourne or Sydney sure, but I’m in Byron and we just don’t operate the same way as the cities. How did you come up with the name – Wear Knots? A drunken night brain storming with friends. Who are the people who have inspired you? Well obviously Zoila who taught me macramé, she is amazing. We keep in touch. She travels all over the world and tells me about different macramé products she comes across. After travelling around the world she and her partner ironically have ended up in Fremantle (Perth) where they continue to do the markets. Zoila met a guy busking at the markets who lives in Byron Bay and she gave a stone to him to give to me when he returned. Months later I went to the Community Centre to pick up Paul and he said there was an envelope with my name on it at reception. It was a stone Zoila picked up for me in Chile. I was touched and have now made it into a piece for myself. 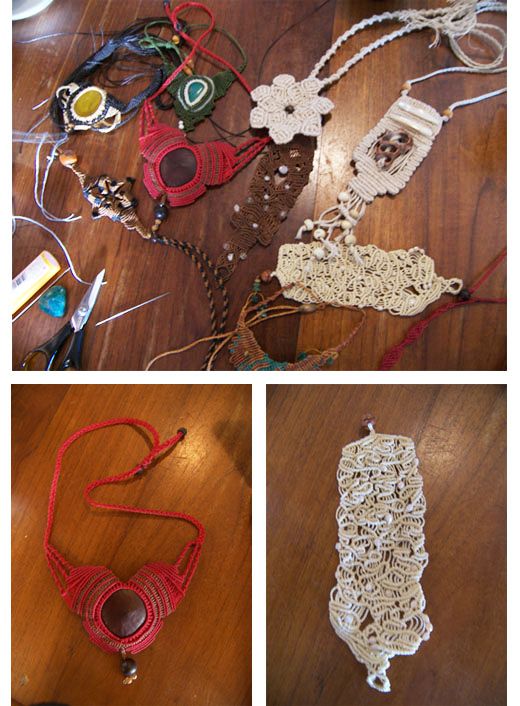 Each of Mariana’s pieces is a work of art, knotted around semi precious gems, seed-pods, shells and sacred objects. In fact Mariana says she could knot just about anything and keeps experimenting to see where this passion can take her. She plays with colour and shapes ranging from the earthy tones through to primary colours and of course a girl’s best friend – black and pearls. Her creative principle is never to repeat a design; something to be valued in our mass produced consumer culture. It certainly places Mariana in the artisan sphere. 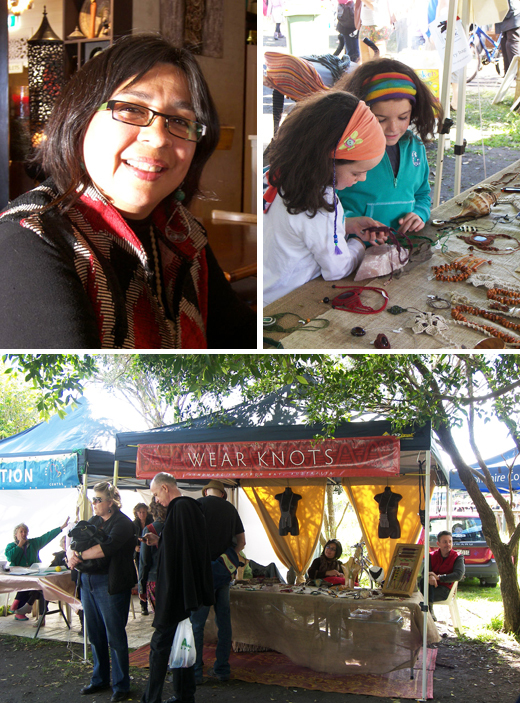 The Byron Market are on the first Sunday of each month and you will find Mariana there (always with her beloved Paul) displaying and selling her Wear Knots creations. She often has people show up with a stone they’ve collected from somewhere or had sitting in the bottom drawer and ask her to create a piece for them. One woman had bought a larimar stone for a special friend and told Mariana the friend was tall, blonde and a teacher. Mariana took the stone with her on a trip to Sydney where she was staying in an apartment overlooking Bondi Beach. Whilst Paul attended a conference, Mariana happily sat on the balcony and knotted away in beige and blue thread. Upon returning to Byron the woman collected the piece and said: “now I just have to send it to my friend in Bondi”. Don’t you just love the synchronicity of life? …Very Byron! Bay Leaf Café for the coffee and Kinoko Restaurant because I can eat most of their menu selection as we are on a macrobiotic diet at the moment. Knotting because I can do it on the beach, in a café, or at home – anywhere. Is there any one person in Byron who has inspired or influenced you? Lots of stall holders at the markets, how they run their businesses or present their products. Corrine Isabel in particular has been fantastic to me – I love her and her clothes. It is such a supportive community there. Facebook! Wear Knots has got a page. Grooven Byron Bay because they have a lot of natural stuff, hemp, bamboo, they sell thread as well. I like the people – Nana and Makoto – who run it. The Byron Market , the beach, preferably Wategos at Sunset for a nudie dip! When I get a bit drunk, clothes get a bit heavy!!! This entry was posted in Art & Handmade Craft, Lifestyle, People and tagged Byron Bay, Chile, Jewellery, Lifestyle, Macrame, Markets, Nimbin, Travel by Very Byron. Bookmark the permalink.